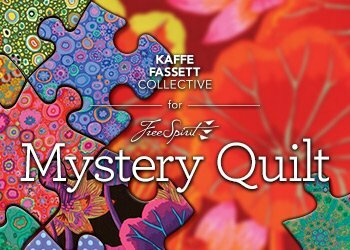 The KAFFE FASSETT MYSTERY QUILT KIT program starts at the end of March 2018. This is a 10 month program for $19.95/month. The pattern and fabrics were designed by the Kaffe Fassett Collective. At the end of March the first project box with a Kaffe Fassett fat quarter pack as a thank you, a calendar of monthly giveaways from FreeSpirit and instructions for that month. From April through November you will receive a package with fabric and instructions for each month. The final size is 82.5" x 82.5" and there are 12 yards of fabric total (no backing fabric). In December you will receive the fabric kit for that month plus binding and the final instructions to complete the entire quilt and solve the Mystery! When you sign up you agree to the complete 10 months of the monthly charge of $19.95. There are no refunds. Sign ups for this event are closed.